Is Global Warming Causing Wildfires in California? 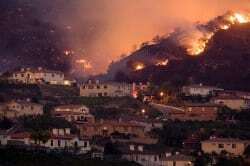 Home > Climate > Disasters > Is Global Warming Causing Wildfires in California? With fires raging on in Southern California and 70+ degree temperatures in October on the East Coast, how can anyone doubt the realities of climate change? 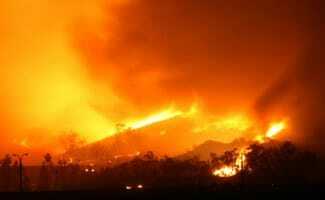 A series of wildfires began burning across Southern California on October 20, 2007. Close to 1,800 homes have been destroyed and nearly half a million acres of land have burned from Santa Barbara County to the Mexican Border with the U.S. As of October 24, 14 people had died and at least 70 more were injured. And, closer to home, the leaves in our yard here in North Carolina have barely started to change colors and it was 75 degrees yesterday – in late October! Because of the warm weather, the leaves have barely changed to the fireworks of fall that we love as one of nature’s most beautiful displays It also is a sure-fire signal of the colder weather months ahead. But, this year is different, as we’ve never seen the leaves turn so late. Is Global Warming Upon Us? We are not ones to take the idea of climate change lightly or to assume that one single weather event or season is a sign of the eminent coming of a hotter time, but with so many weather events and seasons that are explained with the words “for as long as records have been kept”, we must beg the question — is global warming upon us? Last week, forecasters from the National Weather Service “couldn’t recall such intense winds in Southern California,” a region that meteorologists said was “already dealing with the driest year on record.” That is a lot of poorly timed, coinciding events that are bringing this whole climate change “theory” into reality for us. While warm weather in October is a nice surprise, it’s also kind of creepy. And it makes us wonder: is there some connection between this unseasonably nice weather and the raging wildfires in California? With all of these freaky questions swirling around, the time is now to start the dialogue. Do you think there is a connection between our changing world landscape of natural disaster and extended summer weather? How much have we done to create this and further how will we and our children continue to pay to keep our planet safe? More importantly, what are we doing to fix it? Yes, all of these things are extremely related, and I totally know what you mean about the warm weather in the winter being creepy. It is like you are somewhat happy, but wearing a sweater or coat really would not have been so bad. Weather like this feels scary like the end times or something, like something drastic is going to happen. It feels like the calm before the storm. I am hoping that by spreading environmental awareness, and by everybody doing what they can to make a difference, using less resources, recycling when we can etc., and praying with repentant hearts, that God will show us mercy and heal our planet. I do believe that these wildfires are very symptomatic of a global warming problem, and we have to find solutions to these problems and pray to God for mercy before they get worse. I am always a little amused at how arrogant we are as human beings when it comes to how we affect this planet and Mother Nature. The Earth has been in existence for billions of years and in relation to the other living beings that have also shared this planet, we have not really been here that long. I am no biologist but I think no matter what we do, the Earth will go on and some kind of life will be here, it may just not be people, and there really is not one darn thing we can do about it. I do not want to get into some kind of philosophical debate about how the Earth came to be in the first place, but science has shown us one way or the other, this solar system is built to work a certain way and unless our rock gets knocked into some other kind of orbit, the temperature and composite qualities of the planet itself will dictate what grows there and how the ecosystem will operate. We as a species may have a considerable impact on the surface of the planet, but overall and over time, it will all end up the same when the sun burns out or we are struck by some kind of asteroid. In that case, we would be knocked out of orbit and then be in for some real adjustments real fast. These will probably be some really cold adjustments too. Not to get too far off course with this, but I just think that although we do have a responsibility to not pollute the Earth and burn up the natural resources, that responsibility is largely to ourselves and any of the other animals that are unfortunate enough to live here with us. All we are doing is more or less prolonging the inevitable. Which in this case, as was the case with all the dominant species of Earth, is that we will eventually be wiped off of the Earth by one means or another. There is a strong likelihood that we could do it to ourselves, but ultimately nothing lasts forever. Especially a species that does so much harm to itself to begin with. I do not even understand how there is a debate anymore about whether or not global warming is occurring. This winter has been one of the warmest anyone can remember for most of the upper hemisphere and up until we were finally though it, all the meteorologists I can think of were predicting one of the harshest winters in recent history. Things are not quite lining up like they used to for the planet, and the obvious conclusion is that we are finally seeing the effects of years and years of pollution into the atmosphere. Greenhouse gasses have reached a level that heat is being trapped to the Earth like never before, and we are feeling the effect directly and indirectly. I live in the Midwest and this is the first winter I can remember where there were more days where the temperature got above 65 degrees than there were days where it snowed significantly. I had never seen anything like it and I had to wonder if we are finally experiencing what we were warned about all these years. In my mind there is no question, but I am not so sure we fully understand what the results and the consequences of this global climate change will really be. If there is anything that we have learned in the recent decade or so, it is that the Earth has been undergoing some pretty dramatic changes of behavior. The Malaysian Tsunami was the largest loss of life in a geological event in centuries if not ever and Hurricane Katrina came ashore in such a manner that it wiped out generations of history in one stormy night. Everything in this world works in unison with one another. As we continue to warm up the air, so will the oceans increase in temperature. As the oceans get warmer, they will change current patterns and rain will come down in areas like never before. Everything will essentially be turned on its ear, and probably sooner than we think. There has been no debate. The peer review process has been corrupted and the data & people cherry picked to suit political agenda’s. The Malaysian tsunami was caused by an earthquake, which has nothing to do with climate change. No doubt climate change exists, but it is not man made and has been happening since the day the earth was created. If anything global warming would make more moisture and rain occur not droughts because the poles melt and the oceans evaporate.